On January 11, the Africa Growth Initiative at Brookings released Foresight Africa: Top priorities for the continent in 2019, focusing on six key priorities for the region in 2019. The fifth chapter, Africa’s untapped business potential, focuses on the massive opportunities that exist for the private sector in African markets that could generate business opportunities and employment and help many climb the income ladder toward greater prosperity. In their essay, Acha Leke, senior partner and chairman of Africa region at McKinsey & Company, and Landry Signé, David M. Rubenstein fellow in the Africa Growth Initiative at Brookings, discuss five African business opportunities in key sectors. One opportunity is presented by Africa’s ongoing industrial revolution, as local manufacturers increase production of everything from processed food to automobiles. As Figure 5.1 shows, this industrialization process may accelerate Africa’s manufacturing output to nearly double current amounts by 2025. 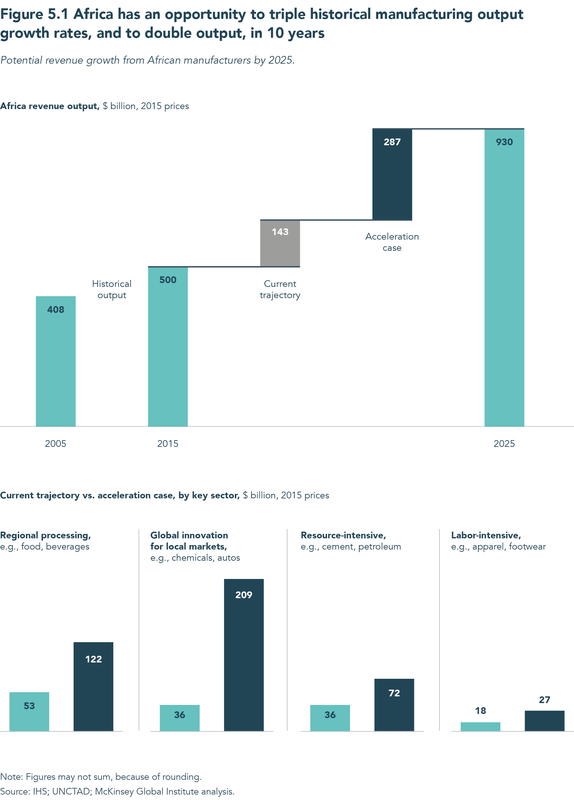 The most dramatic growth potential exists in regional processing (including in the sectors of food and beverage products) and global innovation for local markets (including in the sectors of chemicals and automobiles): Revenue in these sectors has the potential to increase more than two- and five-fold, respectively. According to Leke and Signé, while most growth is likely to come from manufacturing to substitute imports and meet local demand, there is also opportunity to grow exports and make Africa the world’s next great manufacturing center. As Figure 5.5 shows, however, there remain many obstacles for enterprises in sub-Saharan Africa. 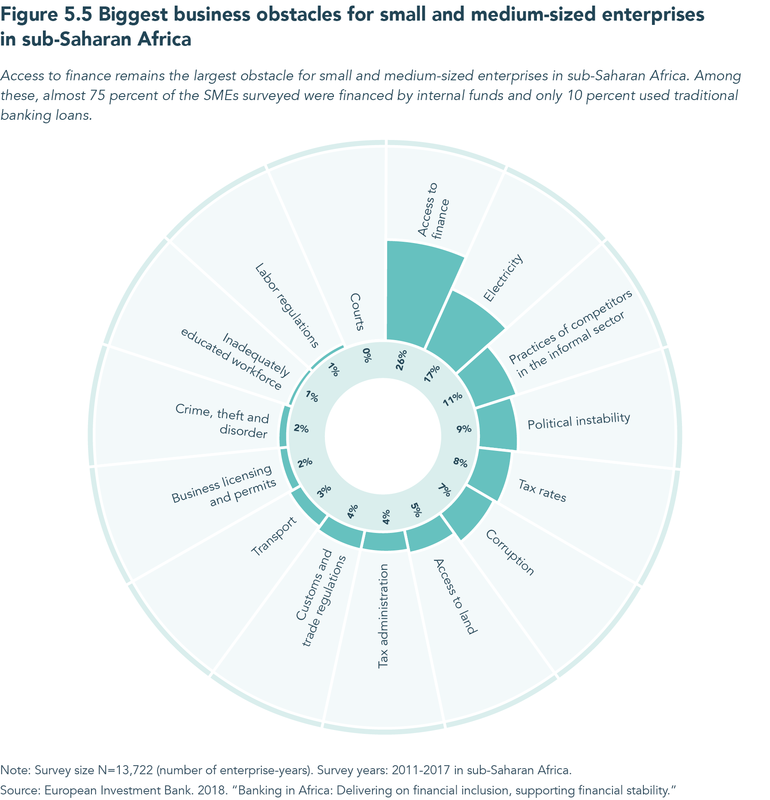 Small and medium enterprises surveyed by the European Investment Bank between 2011 and 2017 cited access to finance as their biggest business obstacle, with electricity, competitors in the informal sector, and political instability other commonly-cited issues. However, as Aliko Dangote discusses in his Viewpoint in the chapter, for those who are willing to learn and understand the intricacy of the region, challenges can be transformed into opportunities for growth and success. Entrepreneur Viola Llewellyn, for example, founded Ovamba, a fintech platform specializing in trade and technology, to address the financing obstacle and offer businesses in the formal and informal sectors short-term capital to create sustainable wealth. According to Llewellyn, since its launch in 2014 in Cameroon, Ovamba has funded 270 small businesses with over $25.4 million, and has seen significant growth in many of the businesses it funded. Throughout the chapter, authors emphasize that the perception of risk for business in Africa often exceeds real risk. And as Brookings Research Fellow Eyerusalem Siba discusses in her Viewpoint in the chapter, finding lasting solutions to development challenges and creating a generation of entrepreneurs requires tapping into existing capabilities while filling gaps and scaling up successful pathways. For entrepreneurs ready to solve problems and innovate to meet Africa’s unmet needs, there are tremendous opportunities to capitalize on Africa’s private sector and growing middle class. Is sub-Saharan Africa facing another systemic sovereign debt crisis?